Right - time for something a bit new. We've realised it's all well and good talking about Star Trek but what's going on now? There's no way we can post every day about everything so how about a monthly blagger's post? We'll pick the top five stories from the month, why they're important and the stuff you need to know. If you like it, we'll do one in April. If not, this might be the first and the last. 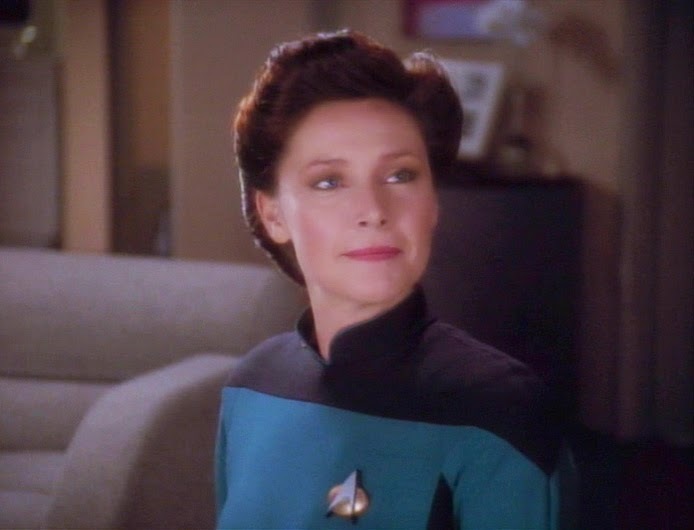 Sad news to kick off the month that the actress who portrayed Lieutenant Commander Nella Daren in The Next Generation's sixth season episode Lessons died at the age of 61 following a battle with cancer. Hughes' character was one of the few to have romantic links to Captain Picard during the show's run and was an unusually music-centric episode which brought the fabled Ressikan flute back to the table and one of two appearances for stellar cartography (although it would look massively different in Generations). The Ron Wilkerson (Imaginary Friend, Schisms, Lower Decks,) penned episode is well-remembered for Hughes performance as one of the few who stood up to Picard and in this case melted his heart a little bit too. Hughes' performance will of course be among those on the soon to be released season six blu-ray. "Warnog incorporates rye malt into a modern Dunkelweizen grain bill, creating a flavor profile that is both familiar and unique...Warnog's aroma is predominantly mild banana and clove produced by the German wheat yeast, supported by subtle sweet malt character from the use of Munich malt. The flavor draws heavily from the blending of the rye malt and traditional clove character, creating a very rich and unique flavor. The inclusion of wheat and caramel malts help to round out the mouthfeel of this beer, making this Dunkelweizen hearty enough to be called a Klingon Warnog." Sounds absolutely delicious and you would expect it to be served in big vats like blood wine a la Apocalypse Rising from Deep Space Nine. Will it make it over to the UK? Something in my mind says no however if anyone over the water fancies shipping us a few barrels to sample we won't be saying no. Reason to know about this? 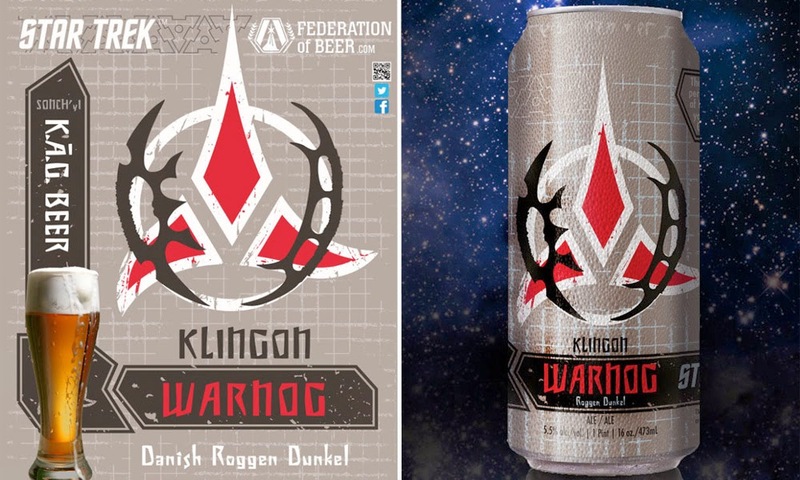 Hell, it's beer...Star Trek beer and that's definitely not your average everyday bit of news. Whether your local Harvester or Toby Carvery will be serving this is anyone's guess but we'll stay in hope. The Ellison graphic novel will be published in the same month as his 80th birthday and will mark his 102nd publication in print, all of which can be viewed here. And when's it out? Try June this year. Fairly inevitable seeing as they've produced seasons one to five and I don't expect any prizes for guessing season seven will be following thereafter. As per usual the upgraded picture is mesmerizing and a huge leap from the original TV quality we experienced from 1987 onwards. Perhaps the bigger element here through is that, in keeping with seasons three through five, fans can pick up the movie edition of Chain of Command in box-licking HD quality to stick alongside The Best of Both Worlds, Redemption and Unification. I suspect that you've seen the trailers, read the blurb and just need to know it'll be landing in the US in June and should be crossing to the UK fairly soon afterwards. 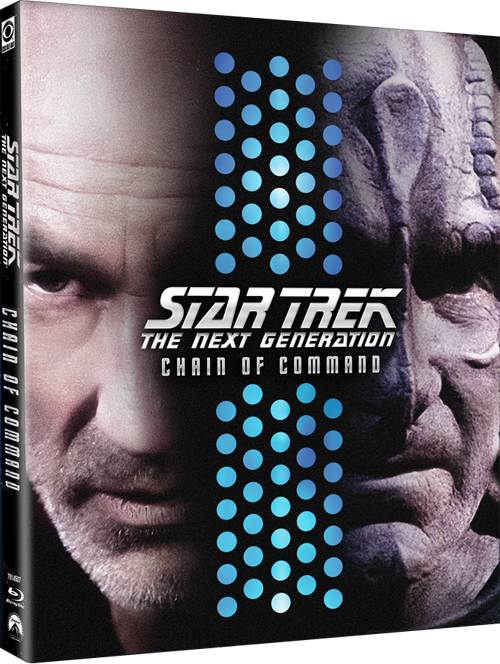 Dropping over to TrekCore recently I spotted that the Chain of Command movie will feature commentary with the Okudas as well as Director of Photography Jonathan West and Captain Jellico himself, Ronny Cox. 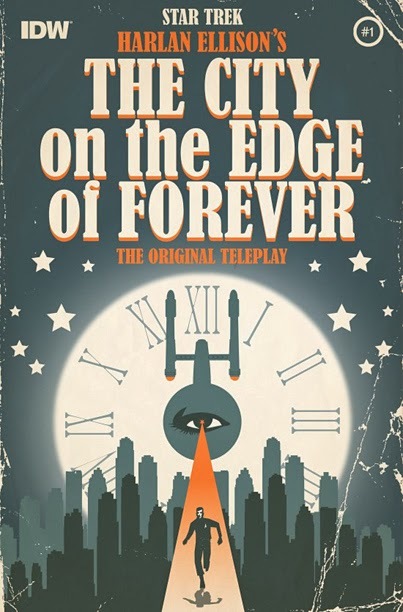 For those of you new to Some Kind of Star Trek we also put together a piece on the story here. Season six will feature the usual array of documentaries, bloopers and extras that have filled out and added to each of the preceding seasons. Kind of reminds me of when they released this movie series on good old VHS back in the late 1990's. Going on this line of one movie per season I guess Gambit is the logical move for season seven as you would hope the full length version of All Good Things... will be the final installment on the full season set - but then if you're in the UK you'll remember it got released as part of the original run VHS series in it's two part format. Ugh. Bad memories. Ever feel like you got totally ripped off when you bought a DVD or a blu-ray? Yep, me too and it's directed straight at the release of Star Trek into Darkness where features were retailer specific and if you were in the UK, the DVD got, like, sod all bar two measly add ons. Bah. Rubbish. So as if to appease us all, you can now scrabble around the internet or a certain video-based website and see all the bits that didn't make the movie and ended up fluttering to the floor of Abrams editing suite (or just being clicked and moved to another file on the PC is probably the reality...). Surprisingly there are a lot of parts removed and TrekCore have done a fantastic job of listing them all through with full transcript on this page and also this one. For many fans the actual nightmare was when the film got released and for a few they're still trying to purge that nightmare to this day. It seems that for the young actor he was totally out of his depth and an utter bag of nerves. I don't think this comes across on the screen and Hardy certainly hid it well. Perhaps it was the three months off booze that helped here?! In an interview for Total Film, Hardy came into the production after all of the Enterprise scenes had been filmed and worked 17 hour days to complete his appearances in the movie. Considering where his career is now with Inception, The Dark Knight Rises, Bronson and the upcoming Mad Max under his belt it's weird to think that this is really where it all started - and could have all ended looking at the reviews. Pine DUI charged and fined £48 - you drink, you drive, you get caught. Not great but that's the law. Do you want to see more of our monthly news roundups? Let us know below or was there a story that we've missed from our top six? It was always clear from the start that once you discount the multitude of Enterprise's, the Starships Collection would have to delve into non-Federation territory and particularly vessels belonging to opposing forces. In fact, the last "title" ship was back in issue nine (USS Defiant) if you don't count the recent special on the JJ-Enterprise. Already we've had Klingons, Borg and Romulans which means that Deep Space Nine's Big Bad's are conspicuous by their absence. Not now however as Issues 13 and 14 cover two of their most prevalent enemies with the Dominion and the Cardassians. 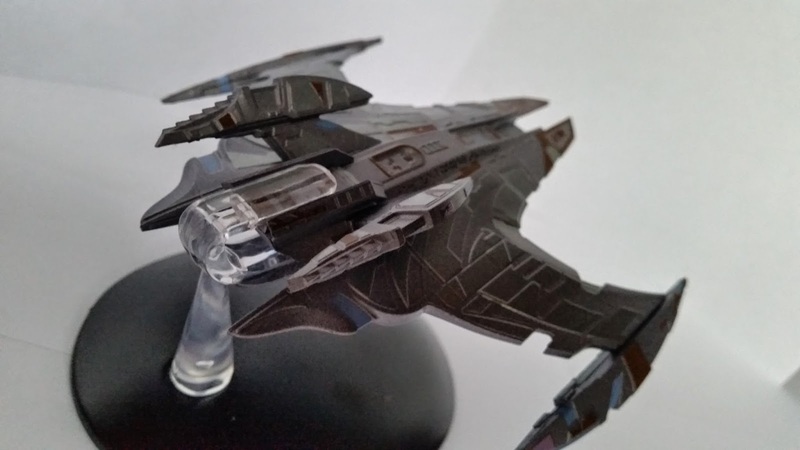 The Jem'Hadar battlecruiser is a heavy, heavy beast with probably the most solid feel of any ship yet to feature in the range (and I'm including issues 16 and 17 which we've already reviewed). The build quality is absolutely superb although it is slightly shiny due to the majority of the ship being made from metal. The extremities here are the plastic sections - fuel pods, cargo bay and upper ion and impulse engine (tail) sections but for once they're very, very solid. There's no wiggle or bend which is a significant improvement over the nacelles on models such as the refit Enterprise or on the USS Reliant. Just be a bit careful however as it's got some nice sharp points reinforcing that these aren't toys and most definitely better placed on a shelf - preferably a high shelf away from prying fingers. While admittedly my son (he's two) has had his hands on Voyager this is one he's going nowhere near. The colouring is excellent and having both a physical and CGI model to refer to have been a big benefit here. The thing that gets me is that on the page it's a a shade more purple than silver but It's origins and design as something that would provide more of a threat than the smaller, nimble Jem'Hadar fighters provides a great insight to some fairly odd designs that didn't make the grade. The focus section talking about the development of the Dominion as the anti-Federation also reveals some fascinating information that originally a larger group of races was intended to be on a par with their Alpha Quadrant peers however time, budget and scope meant a tighter window on the Founders, Vorta and Jem'Hadar. The images accompanying the text aren't anything new but this does seem to be building up into quite an extensive background resource to fill out the pages. Given that there have been a chunk of books over the year I'm beginning to believe that there won't be much head scratching over even the more oddball issues down the line when it comes to finding relevant content. One thing through, don't dedicate a section to Neelix or Porthos. 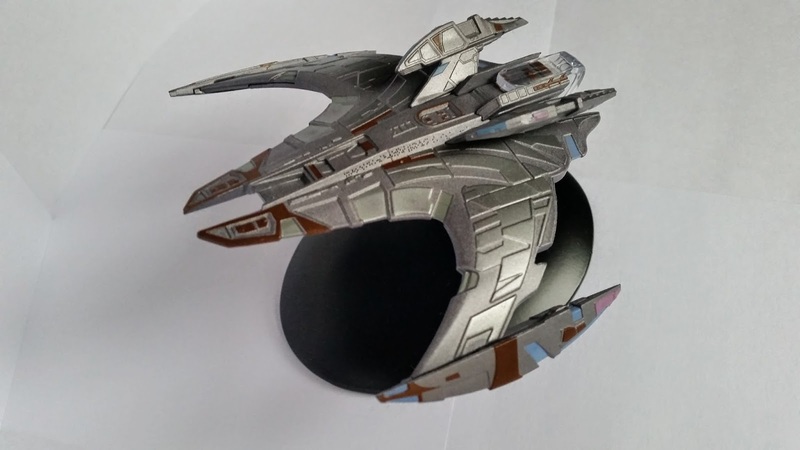 Issue 14 adds to that Deep Space Nine universe with the Egyptian-influenced Cardassian Galor class. Chalking up a ton of appearances through The Next Generation and Deep Space Nine it has to be classed among the more unusual designs to feature. Unfortunately mine is even more unusual with a wonky tail-fin (managed to bend this straight) and a slightly off-centre head piece which makes it look like she's looking to the right for traffic. For note the image to the left is not mine! Coming after the metallic solidity of the Jem'Hadar battlecruiser it's a face palm moment if ever there was one. I like the ship but these two things are a real blow with not even 20 issues under their belt. 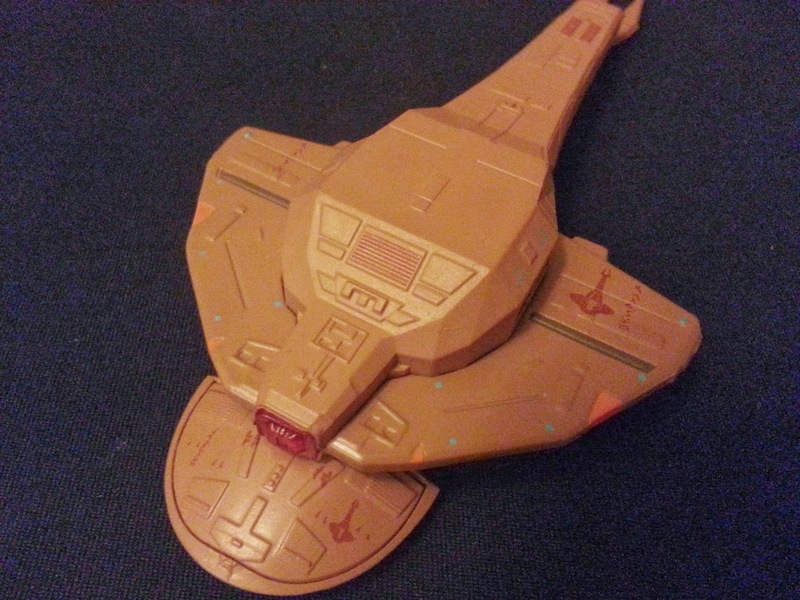 It's also has only one single coloured plastic section - the main deflector on the front which is in red - and also isn't set flat in the hull. That's nothing against the Eaglemoss team who have tried to recreate this as faithfully as possible. The shame is that it's not that accurate either. The hull detailing noted in the magazine around the temple-like structure is absent and the underside seems awfully plain in comparison to both the top and also the images in the magazine. Colour-wise she's also a different shade to the one in the magazine. Inconsistencies certainly reign with this one. I've included an image of my model here to show the underbelly's lack of detail - also not the off-centre head section. If we look back, the strengths of the series have been where Eaglemoss has been able to work in metal and in big chunks. Doing fiddly nacelles and blue plastic venting is an unavoidable factor but it does detract from the good points. She's nicely balanced and, hallelujah, sits well on the stand. Maybe I should just be happy with these improvements over all the other stuff we've mentioned? I may just superglue that Warbird in place y'know and call it quits. How about the magazine? Usual fare really but there are some great pics in here especially the opening shot on the Ship Profile section which not only reinforces the colour but also the detail missing from the underside. 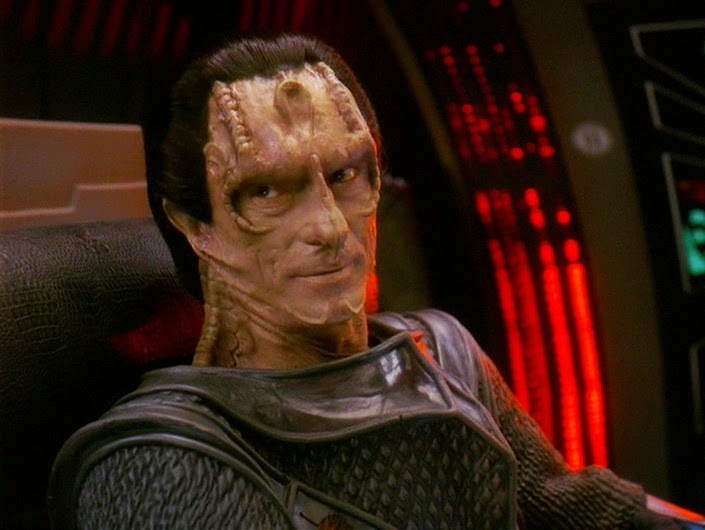 Interestingly we get a profile of Gul Dukat rather than the creation of the Cardassian people that you might have expected (I did) and goes some way to providing a satisfactory overview of just who he was from start to finish. At times I did warm to the character and reading this certainly refreshed my knowledge albeit in very brief form. It even brought home the fact that Deep Space Nine really is all about opposites in every respect - and not just the Mirror Universe. Rounding of this trio of our missed issue reviews is my favourite of the three which just bangs home just how many great ship designs featured in Voyager; USS Equinox. For those in the know the Nova Class name at the least has been banded around since the early 1990s as a suggested replacement for the Galaxy Class however the ship from the Voyager two parter can trace it's origins back to the early design suggestions for a little known ship over on Deep Space Nine called the Defiant. The top of the primary hull is cast from metal and detailed well with windows, phaser strips, registry, the sensor array as well as the unusual recessed bridge which is one of the remnants from that pathfinder project. Turn her over and even the orbital shuttle, the Waverider has been clearly marked out. It's a great finishing detail that helps the Equinox stand out a bit more. Even the nacelles are nicely decalled and the whole thing is a pleasure to see slotted onto her stand. So you're waiting for the grumble aren't you? 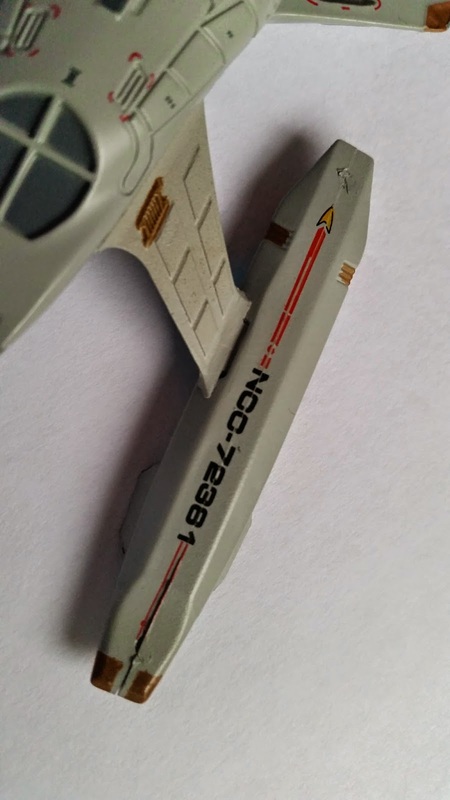 Well OK, the sprue flash is still attached to the nacelles and they haven't been cleaned up very well at the joints when you look underneath but I'm almost prepared to forgive them as she's still a good display piece. Could we also have had her battle damaged perhaps as portrayed in the magazine to add that element of "realism" to the ship? Maybe that would have been time consuming so let's step away from the super nitpicking! There's a lot of little extra facts and figures about the Equinox dotted through the magazine this time and it's a welcome surprise as this, like Dauntless in issue 17 was a one story ship that never saw another outing thus limiting the data available to fill pages. For the discerning collector I can confirm that the numbers on the lifeboat hatches DO match the ones that are featured on the plans - oh and definitely worth mentioning that the colour of the ship pictured matches the model. Full marks. While key appearances is a foregone conclusion before you even get to the back page I'm not sure if Voyager's journey back to the Alpha Quadrant really warranted an entry here. Admittedly the Equinox story was to give us the "what would have happened if..." notion and a comparison article would have well-rounded the story of Ransom and his crew. Notably now we've dropped away from talking about filming a lot of the models as a separate section, combining it instead with the building and design aspects of the story which leaves room for other "human interest" pieces if you will such as more backstory and character related material which is fleshing out the series and allowing it to explore more facets of the franchise with some relation to the vessel in question. With Australia now being added to the list of countries stocking the Collection it's worth a drop by the site if you're looking to order back issues. 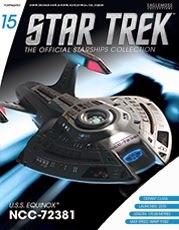 Currently issues one through to six and nine are out of stock as well as the JJ-Enterprise. 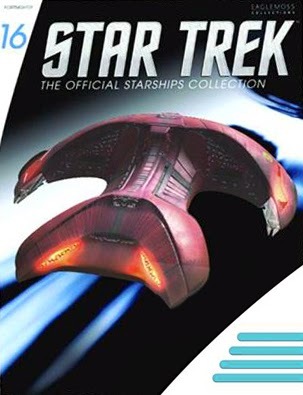 The Deep Space Nine special is now (after a long time) showing as back in stock as is the USS Excelsior which should please +Mark Thwaite who has been waiting for these for an absolute AGE. Taking a ganders over at the Entertainment Earth site is always a good call and now they're showing images of everything up to issue 24(!) and we've included these below just to keep you all in the loop. Clearly we have to advise that these are likely to be suggested and not the final artwork. 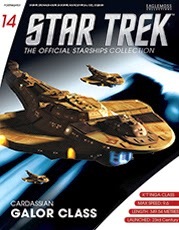 As yet there's no model image for issue 24, the Xindi ship but you can still see the cover at least. You can subscribe to the Eaglemoss Official Starships Collection by clicking the link to the left and dropping over to their site right now - we're only 17 issues through and you don't want to get too far behind! We have Trekspace, there's Facebook, Twitter and all sorts of social media so why would I want to stop off and spend some time on Risa? 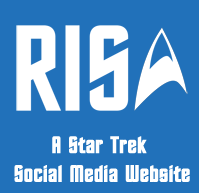 "Risa is a Star Trek social media website designed and built by Star Trek fans. It allows fans to communicate in a social media platform to express their feelings and share their stories. The idea behind this website was to create one social platform where all fans can come together, to share in their stories and meet new people. Risa utilizes the best features of Facebook and Twitter and combining them together, with some more features specific to the network. We are constantly working on the network to make it better, and we are supported by donations from its users, and advertisement. We have some exciting ideas for the future, and we would love to see as many users as we can on the network sharing in all things Star Trek. The idea came about when I had finished completing a mission in Star Trek Online. I wanted to share the result but I wasn't a part of any group, fleet or clan. I then thought how there was no social media website for Star Trek fans. After completing an extensive Google Search, the idea was born. 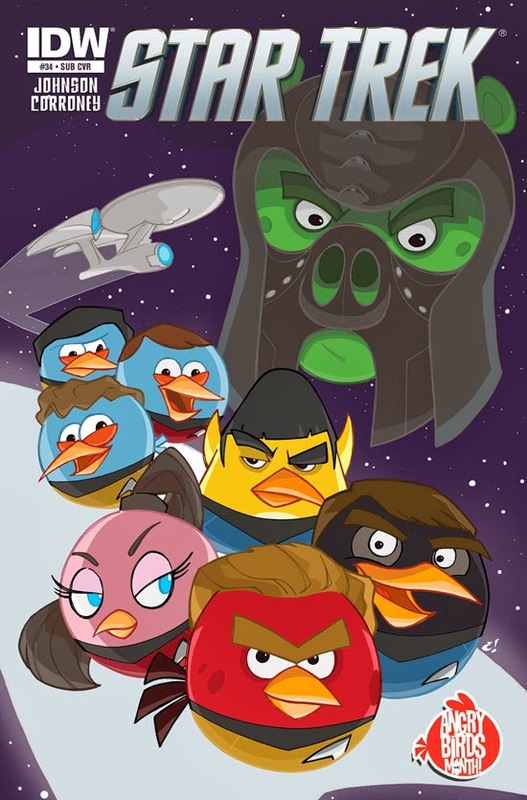 Since then, the network has gone through many changes and now has a staff force of five, with great connections throughout the Star Trek community. Risa is currently proud to have over 450 members and is expanding each and every day. We have a team of three developers who are working on the network to improve it and add new features. We love the idea of the network spreading to all Star Trek fans across the world and we have some great big ideas for the network, but it all starts with the fans. One thing that we pride ourselves on is listening to fan feedback. We love hearing from fans to help improve Risa – after all, we are creating a network for them. 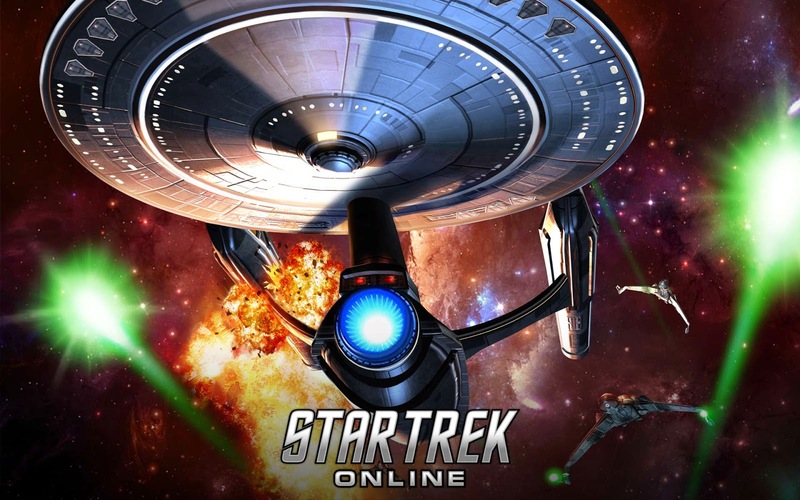 We regularly run competitions with various prizes ranging from Star Trek Online goodies, to Amazon vouchers, to vouchers off costumes, to a Star Trek wallet. This is something we feel is a good way to keep our new community active and also interesting. My vision is that the network will be around for many years to come. We will expand and add many more new features for example; an improved rank system based on your number of posts, mobile apps and integration with other social sites such as Tumblr and many more." So that's the way the guys behind the site see this social media network and it's a brave, impressive venture there can be no question. On the plus side to begin with it's Risa only in name and not a mention of Let He Who is Without Sin wafts through the pages. Thank goodness for that. I'm a member of only a few groups/sites on the internet because I do find they can be very similiar. The only one that I can suggest comes near in scope to Risa is the Trekspace site. That is much more multimedia based, relying on blog posts, users to add pictures, discuss topics in forums (sporadically used) and the like. Now a tour around the site, which admittedly I've not been on for a while showed that there is very little activity aside from mods posting On This Day in History items and in some respects straying from the Star Trek "purpose" of the site. In all honesty I've never, ever been a fan of the look and feel of Trekspace. It appears a bit like a cheap Facebook with a poor layout and is in need of a serious retrofit. Risa does have to compete with sites such as Trekspace because there are a lot of people registered on there. They might not be active but they still planted their flag a while back. Can Risa win this audience? Yes is the answer. For starters the look and feel of the site is much cleaner and easy to navigate. Signing up was a piece of cake and editing your profile was a breeze to complete. Trekspace in comparison has a ton of headers and no clear direction as to what you need to do. Being able to customise your profile easily is absolutely key to winning new users. Make it easy, make it 1,2,3 and the punters will be happy. Now from there I know the team have been doing a lot of work to freshen up the site and it does show. It's a clean, uncluttered layout with very few ways to go wrong. Simply post, add images and you're away and it's very comparable to tweeting or updating a status. I find with Trekspace that things can get over technical and there are just too many things happening on the main page. Risa does offer all that but the message hasn't reached everyone yet and that's a great shame because the potential is mindblowing. I would encourage more people to get on there and start interacting to keep the site going. If the incentives are real then it's a great tool to lure in fans. Originally it might have been construed as a place to discuss Online however with more people visiting the possibilities are, well, endless. Interested in taking the trip? Why not head over to Risa right now and join this evolving network right now. Did you know you can now join up with Some Kind of Star Trek on Facebook or follow us on Twitter or even +1 us on Google+? If you didn't why not drop over there now! It's time to welcome back +Christopher Whitford for his second modelling installment - the motto of the month? Be Prepared. All yours Chris! 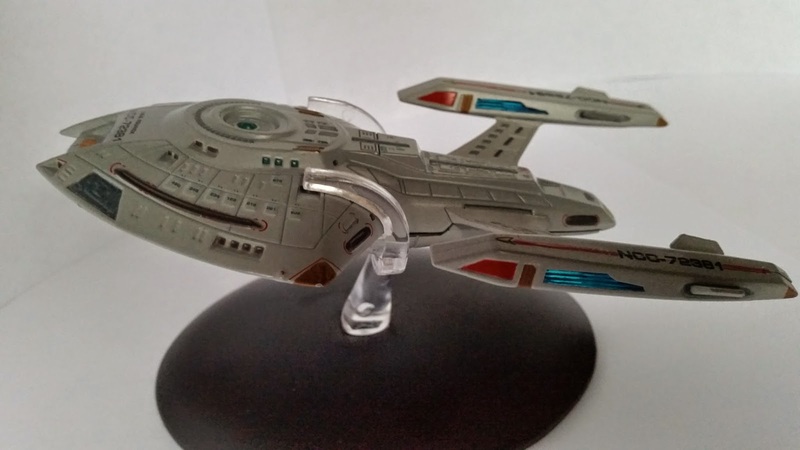 So you think you are ready to build your first Star Trek model? Are you all excited about putting it together, how it’s going to look when it's finished with the paint and decals? But you have forgotten something...? Yes that’s right - what you're going to need to put that model together! In other words the tools of the trade. Some think that the model is the most expensive part of building a model but that is false it’s the tools that eat your money and yes, there are a plethora of tools to help you build a model from hobby knives to sanding sponges. However you don’t need all the tools at once to assemble a model kit. To build any model you need five basic tools and I'm going to list them here for you. The stuff that holds the model together as well as your fingers. It can be quite sticky and if not cautious, quite dangerous to your health. Now I know what you going to say; well that’s all covered so we can use superglue. Well I'm going to say Yes and No as while they are many variants of superglue out on the market and not all are made for styrene plastic. When choosing I recommend a liquid glue such as Testors, Ambroid Pro Weld, Tenax, Tamiya Liquid Cement or ETC. Also I recommend Zap A Gap Medium CA and Zip Kicker for the modeling super glues. As far as fixing clear parts go. you can’t beat Formula 560 canopy glue as it holds clear parts without crazing them (means without fogging) your window parts. You are going to need a hobby knife and while they are many out there I recommend X-Acto #1 Precision knife. It's a invaluable tool to a modeler and your toolbox should never be without it along with some refill #11 fine point blades. Again there are a lot of modeling putties such as Squadron Green and White, Perfect Plastic Putty, Epoxy Sculpt, Tamiya modeling putty - the list goes on. The two I recommend are Perfect Plastic Putty and Bondo glazing and spot putty. The next item you are going to need for assembly is sandpaper and there is a ton of sandpaper grades out there. Anything 400 grit and up is good for plastic models. The 400 grit grade will do your rough work while the higher grits will polish as well as sand. Myself, I use a 3M Medium/Fine sanding sponge as it contours to surfaces and does what I need it to do but watch out as you can sand away too much detail and you will be re-scribing it yourself for an age. thing from those multi-coloured plastic mini-clamps to clothespins and rubber bands. Always remember you never ever can have too many clamps! So there you have it the five basic tools you need to assemble a model kit. Now, here are some money saving tips for you. Buy one or two here, one there and before you know it you will have your toolbox for building models. Save yourself a bit of cash by choosing wisely. Search around before you buy. First is not always best and you'll kick yourself if it's 20% cheaper at Retailer B. 3. Big Is Not Always Best. Wal-mart, Lowes, Home Depot etc are not always the best option. Refer to Number Two! Take your time and don't rush into a purchase. Get what suits your wallet - it might even be that the retailer has a better offer for you online than in the store. Well that is it for this post. Next month we will actually start a model and I'll show you some basic modeling techniques. Until then always remember; Get out of here and Build Something! Want to learn more about modelmaking from some Sci-Fi experts? 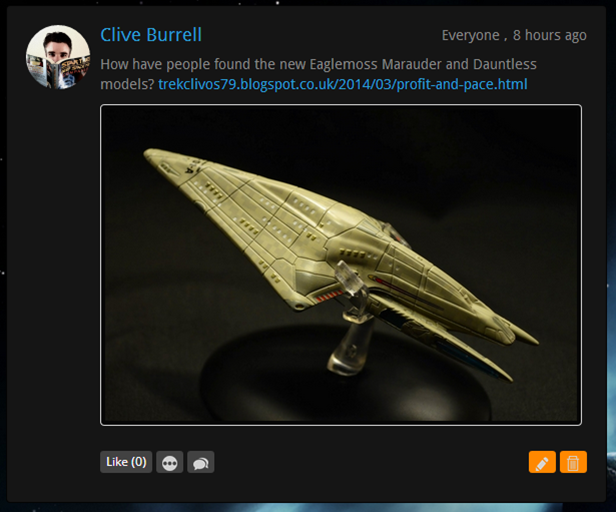 Drop over to the Google+ Sci-Fi Fans and Modellers United Community for tips, chat, advice and some AMAZING photos! It's a Bumper Birthday two weeks ahead with a whole host of names who have appeared or been involved with Star Trek celebrating another year ahead. So where am I heading with this? Well, while a lot of sites will, of course, go loopy over the birthdays of The Shat and Mr Nimoy on the 22nd and 26th respectively yet I want to just take a break from the norm and celebrate the work of two of these figures from the franchise in the form of J G Hertzler and Michael Westmore. Yep, an unusual combination but then we're not known for keeping to the norm are we?! That's not to say that any of the others are lesser mortals or ever less worthy of birthday shout-outs but I have to admit to being something of a Martok fan. J G Hertzler also has the claim to be in the first scene of Deep Space Nine, acting in the role of the Vulcan captain of Sisko's ship, USS Saratoga as well as Roy Ritterhouse in Far Beyond the Stars, the shapeshifter Laas in Chimera and the Hirogen champion in Voyager's Tsunkatse. Also he'll soon be seen in the fan production Star Trek: Axanar as Captain Samuel Travis. While all worthy of a mention none come close to his brilliance as Martok (changeling or not!). While we first saw the general in The Way of the Warrior it wasn't until season five's BIn Purgatory's Shadow that we met him properly. For me he was one of the key secondary cast of Deep Space Nine from that moment. Martok was the archetypal Klingon, believing in the glory, the honour and certainly the thrill of battle as well as proving to be a valuable asset and ally to Sisko during the later years of the series. More of a thinker and a planner than other Klingons we had met, there was always a glint in that eye that betrayed something more - a man of many layers and definitely a great counter to both Worf and Gowron. This of course gives me a blatant excuse to round out three of his greatest moments. With just a touch of help from Worf, Martok takes the reins of the Empire from the apparently glory-hunting Gowron. 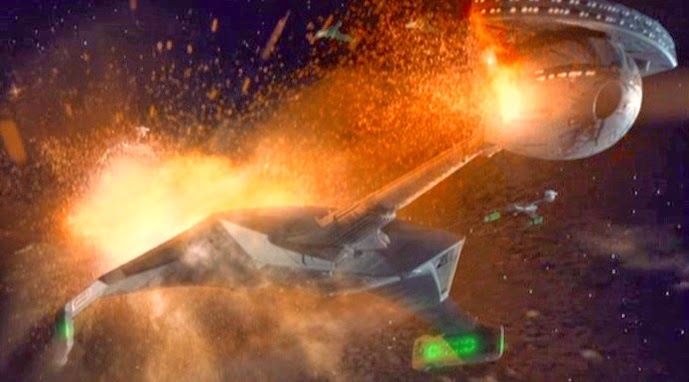 Well-deserved there and it's, for me, one of the best episodes of the final ten (Tacking into the Wind) if only for the epic hand to hand fight that has been brewing since the mid-point of The Next Generation let alone The Way of the Warrior. 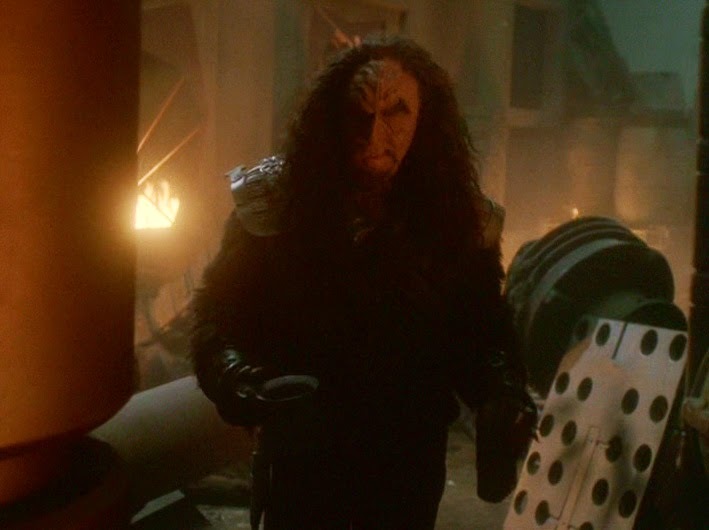 Martok's relunctance to accept the mantle of leadership is absolutely in keeping with the character who has always wanted to be a warrior in the ranks rather than giving the orders - something even alluded to in his choice of a Bird-of-Prey as his flagship. 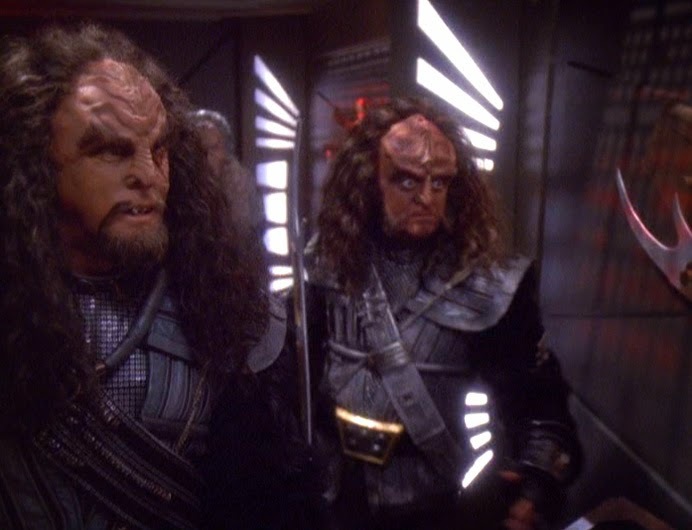 While Sons of the Empire isn't going to make your top ten, it's a good solid Klingon episode that sees Worf assist Martok in gaining the respect of his crew on the Rotarran and return to the warrior form that had eluded him since escaping from the Jem'Hadar prison camp. It's a significant turning point in the character and sets him up well for the events of the next two years. It also leads Martok to welcome Worf into his family's house since the House of Mogh no longer exists. Now a controversial one. While Sisko and Admiral Ross might not have approved it's a good nod from the writers back to a reference in season six that the three of them will be drinking together on Cardassia when it falls to them. Just to see Martok savouring victory is worth the admission price alone. One of the things Deep Space Nine always managed successfully was their ability to drop hints in early and then bring them to reality a year or so later when you least expected it. Or had just damn well forgotten. We could also have included his first appearance fighting the Jem'Hadar or perhaps his reluctance to command the Ninth Fleet but for me, these are three of the strongest memories I have of Hertzler's character. Honestly this doesn't do it justice and I'll be putting a larger piece together soon. Then there's Michael Westmore. The face of the 24th Century you could say. Responsible for the look of many a creature from The Next Generation through to Deep Space Nine, Voyager, Enterprise and the later four classic movies we'd like to pay homage to his top three creations. Those classy spoonheads appeared back in The Next Generation before becoming the staple baddie of Deep Space Nine for a few years as well as providing that show with a ton of backstory. Reptilian in look it's instantly recognisable and incredibly intricate when you start to really examine the structure of the neck and how it's actually very, very skeletal on the outside. It's not just one piece though as each section around the eyes, ears and chin are all separate bits that combine to create the finished look. Think about doing one and then consider that there were a lot of these guys walking around for seven years. It's the classic, the one that gets quoted over and over again but you know what? It's brilliant. Every episode and for every day the Trill spots were hand painted onto Terry Farrell to portray Jadzia Dax. We all know that each set was numbered but it's just one of those things that shows how dedicated to his art Michael Westmore was during his time with Star Trek. To think that every set was different and to have the patience to do that for six years! 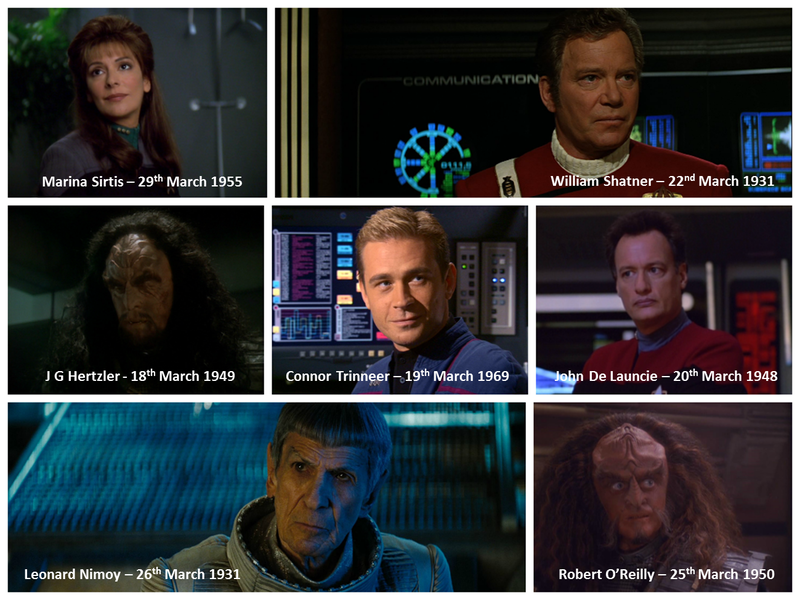 So Happy Birthday this week and next to this host of Star Trek stars! Perhaps you have a favourite moment we haven't highlighted or one from the others who are celebrating. If you do, why not drop it in the comments below! 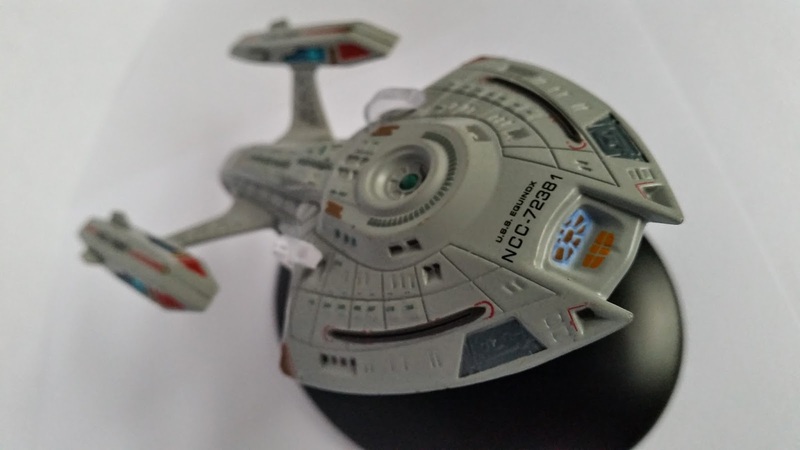 Opinions are certainly split down the middle with the Eaglemoss Official Starships Collection as it nears 18 months since it's arrival on UK shores. 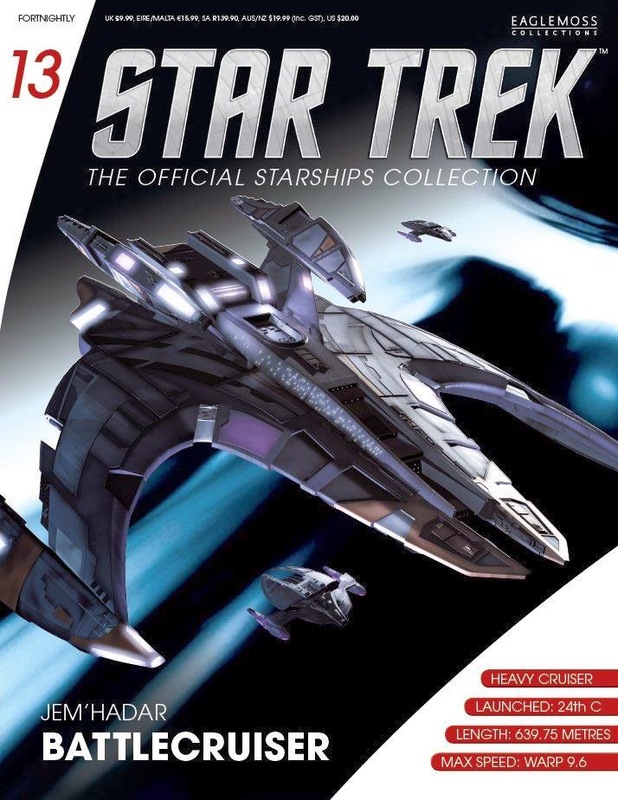 Issues 16 and 17 were previewed on startrek.com recently but now we can give an even better evaluation of the crab-shaped hull of the Ferengi Marauder and the sleek lines of the USS Dauntless. The Marauder is not one on my Must Have List but the result from Eaglemoss is actually pretty decent. The mold is good and the hull nicely detailed even to the level that the underside has the imprint of the shuttlecraft conceived back in the early days of The Next Generation. This is a good contrast against the poor belly detail on the Bird-of-Prey from Issue Three so it gets a big thumbs up from us here. Colour-wise there is a whitened/dusty effect to the rear of the cargo hull that doesn't appear on the preview images you might have already seen. Not a big complaint but it does show that these models are being updated even up to publication. The hull colour and markings have been painted excellently although there does seem to be some detail discrepancy between the illustration in the magazine, particularly around the impulse engines when compared to the rear of the model. I suspect this was fiddly to sculpt hence its "omission" from the lower, plastic hull. Oddly the ventral view of the Marauder is very sparce in detail compared to the model itself. The display stand is another car-crash disaster if you follow the magazine's display instructions and reminded me straight away of the instability experienced with the Romulan Warbird from Issue Five. Slip the clear clip around the front section rather than the rear and it's a lot more stable. The Marauder might not be the most often seen starship in the franchise but it's one that couldn't be missed. I would have hoped however that the underside of this model had received the same detailed treatment as the metal upper section. It is perhaps one for the completists rather than the casual fan. The accompanying magazine does provide some, brief, history to the craft but is more focused on the Ferengi. Significantly for a race that appeared in every generation except The Original Series and the movies, this is their only entry into the collection and as such there's quite a bit to get covered in just 16 short pages. Creation of their look, the change in their motives and characterisation are all here but there's nothing new to add to what fans will already know about the profit-hunting Ferengi that hasn't already been written elsewhere. That's also the line that we can level at the USS Dauntless which arrives in Issue 17. Hands down I love this ship; all seven decks of her. The design is a classic and while not officially a Starfleet vessel there's hints of what might be in those sleek, bullet-like lines. Damn cool. If you're familiar with the 1990's book Star Trek Action! then the design history of the Dauntless will be worth a skim read at best. For a ship that appeared in a single episode there isn't going to be much more to add and the content here is just the same as I read all those years back. If you get a chance, it's a good book to get if you can find it (minor plug). The curve ball in the magazine is that we get a line on the creation of Seven of Nine and the difficulties of that silver catsuit that was just about everywhere you looked when her arrival was announced for Scorpion, Part II. OK, I have to say that some of the tidbits here were interesting and I didn't know a lot about the costume design or the thought processes behind her introduction to Voyager. It's perhaps more of a draw than the details on the ship itself and that troubles me. 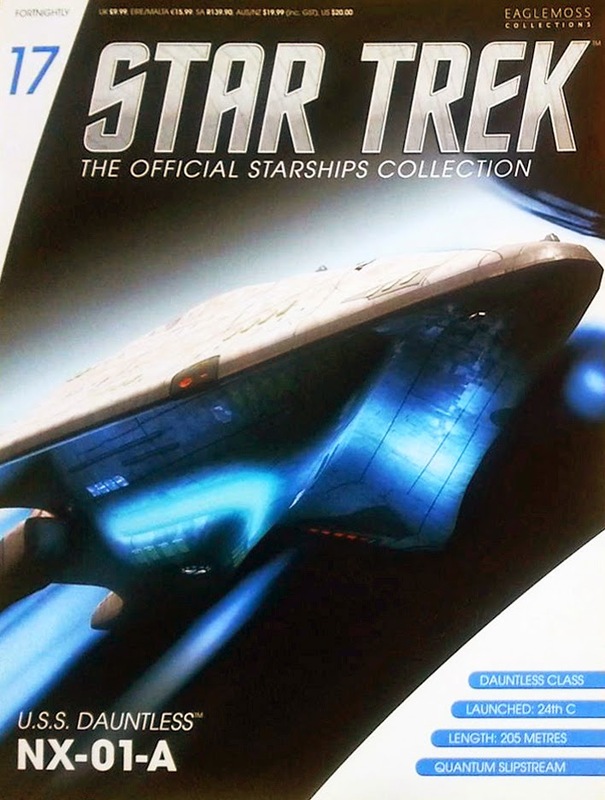 While this makes a fascinating read, it does blow a huge hole in the Eaglemoss Starships Collection mission perhaps - it's about the ships not the characters and having a significant section dedicated to a main character wasn't what I expected. It also emphasises how little information there is on the Dauntless in the first place. Mind you, the Seven of Nine story does nicely tie into the episode Hope and Fear which rounds out her integration/origins story started at the beginning of the same year. For those of you that are passing fans and liked the ship in it's sole outing you won't be disappointed with this literary addition to your Collection library. Certainly even for the most ardent of fans it'll give you a nice easy to flick-thorough reference point. Enough about the magazine; let's talk ships. 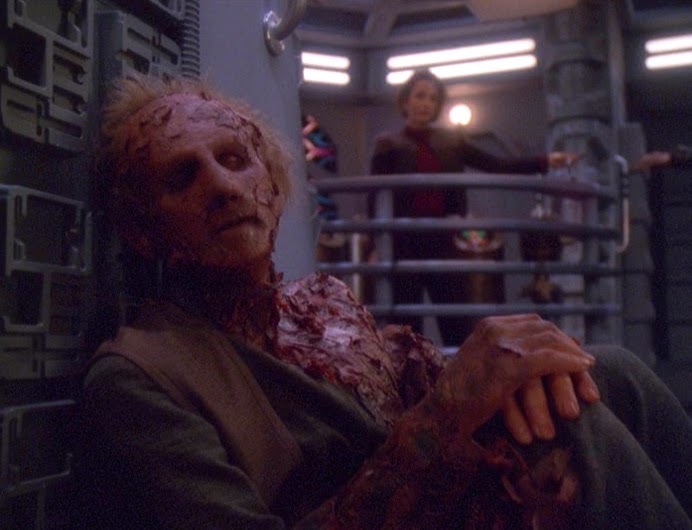 I am massively jaded by Hope and Fear being one of my favourite Voyager episodes. The whole concept of a way home that turns out to be a total load of bull just to get revenge is great and I fell in love with the "alternate" Starfleet designs we see implemented on the bridge and throughout the Dauntless in an instant. Sadly Eaglemoss won't be providing us with replicas of the interiors (future series perhaps...) but what we do get is the tightly packaged hull and nacelles of the faux-Starfleet ship. Admittedly missing the USS Dauntless moniker across her back end (which is shown on page two of the magazine) I am still giving the result a solid thumbs up. The upper hull alone is in metal this time with the lower hull (incorporating the blue light of the quantum slipstream drive) and the nacelles are rendered in plastic. One complaint is that the blue strip on the outside of the nacelle isn't flush and I've caught my thumb a couple of times on it (awwwww). No blood drawn but it's annoying and sends a shiver down my back every time! Also there's a bit of sloppy painting on the outer edge of the primary hull where some darker grey has flaked into the lighter grey of the hull - is demand causing issues of accuracy? Well one of my other colleagues also received Dauntless this week and wasn't thrilled that it seemed to be badly fitted together. Their concerns over the maintenance of quality in the collection was the first topic of our conversation. 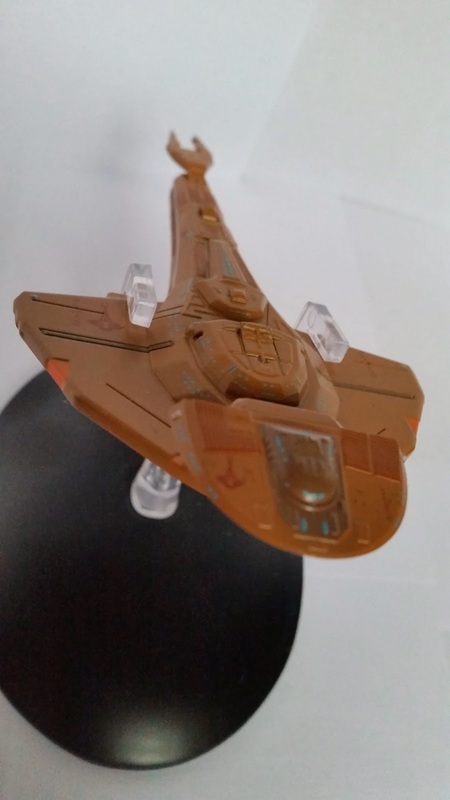 So, Eaglemoss, please take note that some of these ships are getting to collectors in the less than perfect condition that we were seeing with the earlier issues. However, it's not all doom and gloom as the paint job is excellent, harking back to the aztec schemes we saw on the Enterprise NX-01. The hull detail too is great to examine, showing up all the lifeboat hatches, panelling and windows which is mainly thanks to the size of the ship in the first place. It's a great recreation of the ship and I'm very pleased that it's come out well considering how much I was looking forward to this one. It hasn't disappointed and I feel in some ways relived and not as apprehensive looking ahead to the Enterprise-E and Prometheus for example. There were a lot of rumblings about the quality and while, yes, there are some slight missteps overall (and considering demand) the results are still good. Overall? 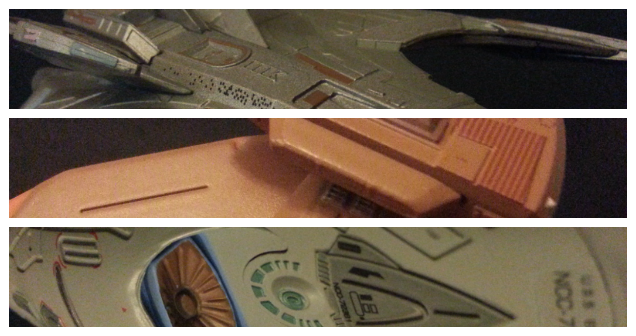 Two nice additions and a great effort although neither is a patch on the detail and quality of the NX-01. That is still the firm benchmark and the challenge has to be laid down for Eaglemoss to rise to it and hit that mark once again. 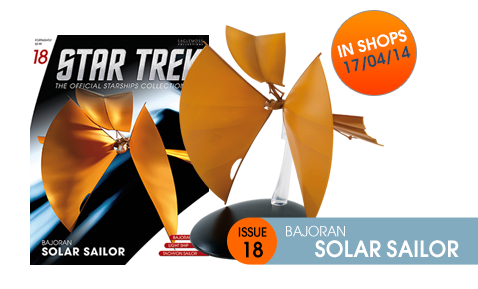 Next month's issues feature the Bajoran Solar Sailor from Deep Space Nine's Explorers and the USS Stargazer fromThe Next Generation's The Battle. Both are single episode vessels (although the Constellation class was reused in other episodes) and again it might be a challenge to fill the accompanying 16 pages. In some respects though it's not a bad thing that we're left in suspense as to how the content will be made up beyond designing the ships. Bajoran mysticism? The Emissary? More on the Ferengi or perhaps the Picard Maneuver? We wait to see. 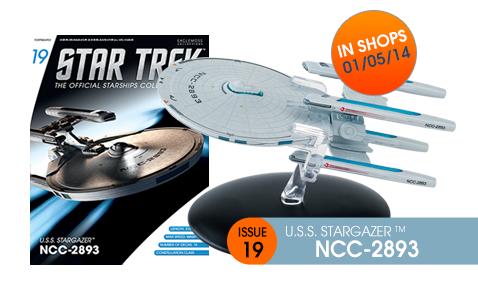 The Eaglemoss Official Starships Collection is available from newsagents priced £9.99 (UK) every fortnight. You can also subscribe by clicking on the link in the sidebar and head there now to secure your ships.